英文摘要：Pine wood nematode (Bursaphelenchus xylophilus) is one of the hazardous forestry quarantine pests in China, and the pine wilt disease caused by this species has brought great economic loss and hindered the development of forestry health seriously. To monitor and control pine wilt disease in Sichuan province, we survey the potential distribution area of B. xylophilus based on the geographic distribution data (B. xylophilus: n=208, Monochamus alternatus: n=803) and 19 bioclimatic data accessed to the Sichuan Forestry Department, and the potential distribution of B. xylophilus in Sichuan province was predicted by MaxEnt and ArcGIS. Meanwhile, the receiver operating characteristic was used to test the simulation precision, and the "Jackknife" method was conducted to determine the importance of the environmental variables. 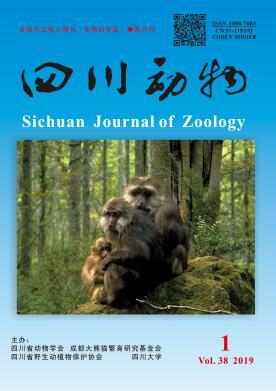 The results showed that the highly suitable areas for B. xylophilus were Yibin, Guang'an, Dazhou, Zigong, Xichang, and the ecotone of Leshan and Meishan cities, and the area was 36 541 km2. The important environmental variables affecting the distribution of B. xylophilus were the mean temperature of the driest season (the range is 1.5-8.0 ℃, the optimal is 6.4 ℃), the seasonal precipitation coefficient of variation (the range is 22.5%-34.0%, the optimal is 34.0%), the lowest temperature of the coldest month (the range is 0.4-2.5 ℃, the optimal is 1.9 ℃), the elevation (the range is 250-5 500 m, the optimal is 450 m), the annual temperature range (the range is 5.9-9.1 ℃, the optimal is 5.9 ℃), and the annual precipitation (the range is 64-135 mm, the optimal is 68 mm).